In a recent commentary in the Journal of Chemical Education (Link) W.B. Jensen questions certain claims made by Wang et al. in their 2007 publication on the detection of the elusive molecule mercury(IV) fluoride (DOI). Also in 2008 Rooms et al. report they were unable to repeat a similar feat (DOI). About time to shelve mercury(IV). The Chemical & Engineering News had reported enthusiastically on the Wang publication (Link) and for a good reason. 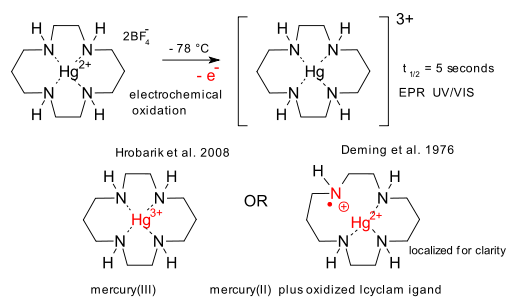 For HgF4 to exist, the mercury ion requires a +4 oxidation state with a breached d10 subshell configuration. This in turn means that mercury would move from the select group of post-transition metals to the group of transition metals the reason being simply that transition metals are defined as having partially filled d-subshells. The Wang group did not isolate the compound but observed it indirectly. After irradiating a mixture of elemental fluorine and mercury in an neon matrix at 4 degrees Kelvin they found evidence for its existence by an specific IR absorption band that persisted all the way up to 12 K. In an argon matrix the IR band was especially weak but detectable up to 25 K.
Jensen now argues that given its surroundings , HgF4 is only kinetically stable and when given a chance would immediately react to form polymeric HgF2. In the new Hoffmann/Schleyer and Schaefer doctrine (see earlier post) the molecule would be fleeting at best but not viable. Finally, JF Rooms was unable to find evidence for HgF4 in his argon matrix up to 10 K, a finding he presents as in agreement with the Wang result (which clearly it is not). Intriguingly although this group has apparently been searching for years for HgF4 in argon the article fails to explain why they did not switch to neon.